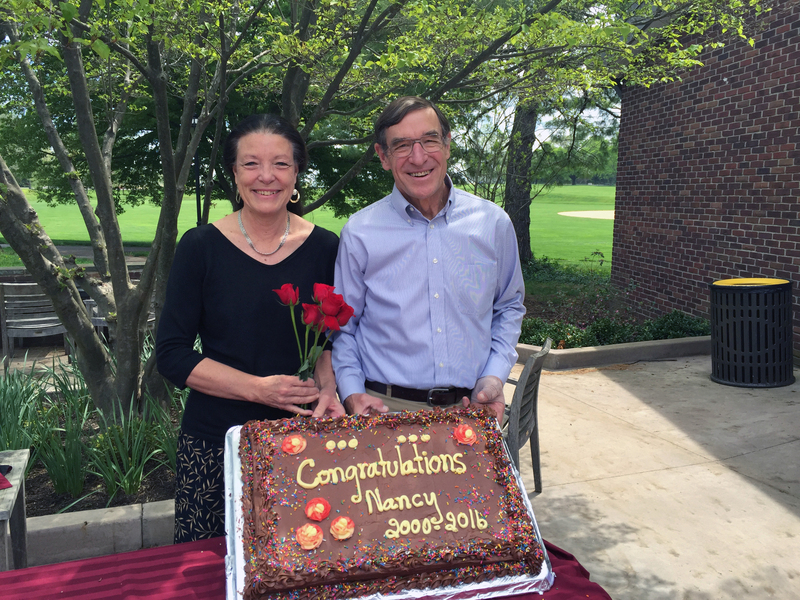 I am grateful for this opportunity to speak to you on the occasion of Nancy Starmer’s retirement. Standing here before you in May of my thirtieth year of service, I am struck by how time has tempered the faces of so many friends and former students and colleagues. Men and women I knew as adolescents sit before me today with the wizened faces of professionals, artists, and parents, the youthful and dreamy countenances of their youth replaced by more mature and thoughtful visages. It is at once striking and miraculous to see how time records its ineffable movement on these fragile bodies of ours. Most of all, though, I am struck by how, after three decades, I alone among us all seem to have remained utterly unchanged. It is quite remarkable. This week I took the liberty of calling seven local Friends Schools. I asked to speak to their communications people, inquiring, in the bright light of Friends testimony about equality, had they ever had a permanent female Head of School chosen for the task by a committee prior to 2001. (As a card carrying Quaker I felt it permissible to ask, perhaps even to ask in an irreverent tone). Every one of the Quaker schools in the area answered the same way: no (although two schools reported having had an acting “mistress” for two years, in both cases until the right fella came along.) Put another way, despite our testimony of equality, for 327 years since the founding of Penn Charter, the oldest Quaker School in the world, in 1689, there were no qualified female applicants, not a single gal considered worthy of holding the candle until Nancy Starmer came along in 2001. You must be one hell of a lady Nancy. In my sixteen years under her leadership, I never heard Nancy, not once, talk about the special challenges of being a woman in charge of a Quaker school. I have heard, however, perhaps thousands of times over that same time span, many, many people make claims about their expectations and assumptions concerning how a female head of school should, indeed ought, to manifest herself in that role. I think that the leader of any organization exists, in some sense, as a hologram among the community she leads. In the mind’s eye, we turn them this way and that, reflecting not their reality so much as our own, the special needs and desires and expectations we project from our own idealized portrait of her and ourselves. Imagine, those of us who have never led a large, complex, dynamic institution, what it must be like to know with clarity and certainty that every decision one makes, every opinion one voices publicly, every mistake one regrets with humility, will be scrutinized, embellished, praised, denounced, and that you personally will in alternate turns be vilified or sanctified and ultimately considered calcified. Imagine the weight of it day in and day out, for sixteen years. Consider as well the pressure of knowing that if you attend a varsity boy’s game, and not the equivalent girl’s contest, you may likely be seen as uncaring. If you miss a play, a performance, a contest, a dinner, you will be condemned by many as lacking in awareness or empathy, but when you attend, it will often be seen as pro forma in most cases. Imagine being at the head of the ship when a student dies on your watch and you must walk with the family through their inexpressible grief, or dealing with it when a faculty member suffers some terrible and inescapable personal tragedy. Imagine realizing and understanding that you must stay mum about the details, while others, who know little or nothing of consequence about such matters, talk incessantly about them and your shortcomings as a leader in handling the situation. Until we have stood in that particular and peculiar wind tunnel, I do not know with what standard anyone can judge. Yet, it is in our nature to judge always, rightly, wrongly, and at times, blindly. Consider if you will overseeing ninety faculty members of varying degrees of eccentricity, idiosyncrasy, loyalty, independence, and obstinacy. Imagine supervising the heads of many departments and trying to understand, to empathize, and sympathize with their myriad perspectives, challenges, strengths, and shortcomings. Imagine, if you will, working a seventy-hour week, falling at last to sleep, and awakening the next morning to a desk beset with new problems, challenges and opportunities, many of an ambiguous and politically tenuous quality. Imagine doing this week after week for sixteen years, and doing it as the first woman ever chosen to formally lead a Friends school. This story needs no embellishment from me. In sixteen years, Nancy has apologized to me personally on at least twenty occasions. I have heard her apologize to the faculty at least as many times. I wonder how many times she was thanked for those crucial and difficult and essential acts of humility? Since 2001, 327 private school have closed in the United States. We were not one of them. Thousands of teachers were laid off in private and public schools across the country. None were furloughed here. In fact, during that time period, we graduated over two thousand alumni, over 500 International Baccalaureate Diplomas. We dramatically refashioned the campus landscape, adding two major buildings, a completely refurbished history center, four new faculty houses, and a hundred renovations and additions that are scarcely acknowledged but deeply useful. Darwin said that survival ultimately belongs to those that are most adept at adaptation. For sixteen years, Nancy has adapted to more cultural, financial, existential, political, and personnel challenges than I could even begin to catalog here. She adapted; we adapted, and we are still here, offering a particular and peculiar type of education, and we are poised for our next epoch. Back before Jack and Nancy were at Milton Academy they were the youth leaders at our church in Needham. We spent a lot of time together in those days. We knew they were special and were sad when they moved on, but knew that that was meant to be. They were the main reason I chose the College of Wooster for my undergraduate education.